I had a nostalgia spasm a few weeks back and bought one of the new model Stylophones. It brought me, oh, 15 minutes of fun playing along with CDs before it went on a shelf to gather dust. So you cannot imagine how gutted I am to have missed this beast on eBay. Up until an hour or so ago, I wasn't even aware of the existance of the Super Stylophone - now I want one so much it hurts. 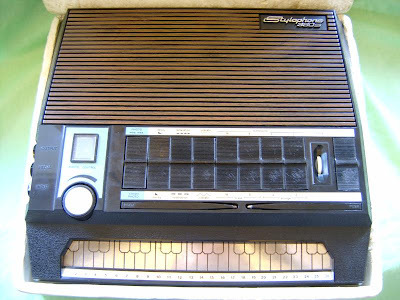 Yes, it's a 'pro' stylophone - it has *two* stylii (do you use them like chop sticks?) and a photo-cell that you can wave at to produce wah effects (just like my Fantom!). It has a range of sounds, it has controllable sustain/decay, it has vibrato and, err, reiteration. It's seriously rare and I'm sure would impress impressionable women. Now, maybe you know all about these machines. Maybe you're sitting there at home, knitting stylophone covers with your dual stylii. But, if you're like me, and had spent most of your life blissfully unaware of it - but suddenly find yourself with a thirst to know more, visit 'The Stylophone Website' and be amazed by the matching amplifiers, the 'bass' stylophone (think TB303) and the rather cute Hong Kong rip off.